An elegant wine that expresses all of the intensity of Sicily. 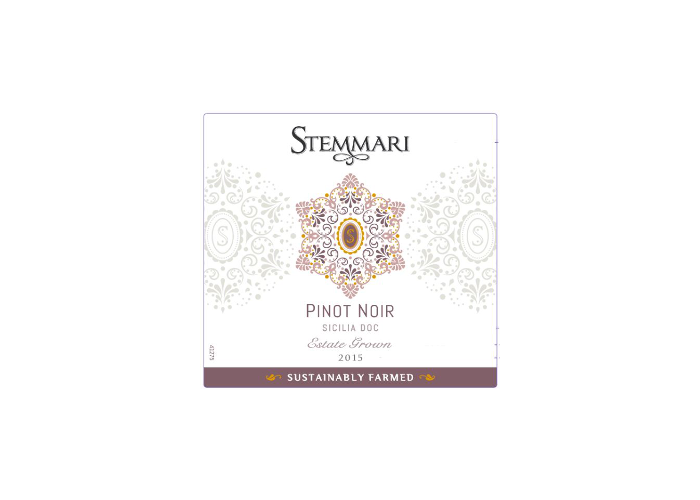 This wine is produced in Sambuca of Sicily, in the province of Agrigento. It is best when grown with a lot of sunlight and in soil that has a light amount of clay. The type of farming is “Espalier”, used with an average density of planting where there are 4500 plants per 2.5 Acres. 100% Pinot Noir. It is a variety that is precocious, maturing around the end of August or beginning of September. Collected from the grapes that have achieved perfect, aromatic, and polyphenolic maturation, they are de-stemmed and cooled for compressing and maceration at 54 degrees for 2 days. The successive alcoholic fermentation takes place for 7 days at 77 degrees. A small portion of the wine is matured in French oak barriques for 6-7 months. Color: Ruby red with reflections of violet. Bouquet: Emerging notes of matured fruits like blackberries, wild strawberries, cherries integrated with inklings of spice derived from the aging in the wooden barriques. Flavor: Dry, with a structure of delicate tannins, balanced by a pleasing acidity and a fruity taste on the palate. Accompanies savory first courses like pasta with meat sauce, second courses with red meats, medium-spiced roasts, and semi-matured cheeses.